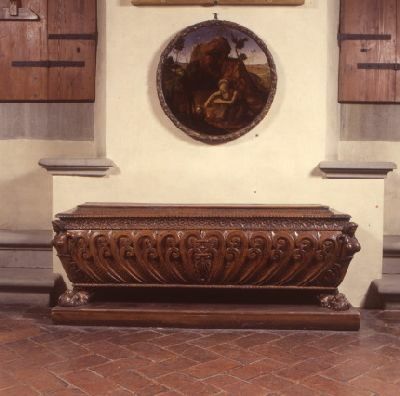 The Horne Foundation Museum has its origin in the last will and testament of Herbert Percy Horne and is made up of a rich collection of art works left, together with the palace in which they are housed, to the Italian State. Herbert Horne born in London in 1864, an architect and a man with many interests in the field of art, ranging from literature to music, took up residence in Florence, once and for all, towards the end of the 1800’s, thus initiating his activity as a collector and a scholar. 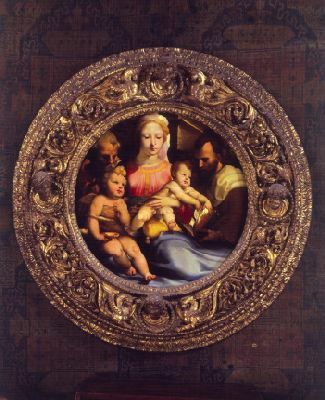 His essay on Botticelli is still of great interest today. In 1911 Herbert Horne purchased the palace in via dei Benci, completely renovated, most likely, by Simone del Pollaiolo, also known as Cronaca, towards the end of the 1400’s probably after the property passed from the Alberti family to the Corsi family, cloth dyers. The principal architectural lines of the palace with its two three-order façades are accentuated by the lively presence of the ashlar-work that outlines the doors and windows and emphasizes the building’s sharp edges. 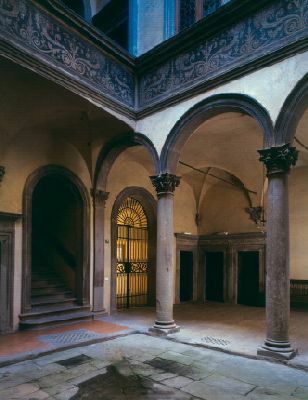 Across the internal courtyard that has a three-arched portico on one side only, one enters the basement room that the Corsi family used to wash the fabrics. Herbert Horne dedicated himself with great care to the restoration of his “palagetto”(little palace) with the intent of creating, not a museum, but an example of an aristocratic residence of the Renaissance. After Herbert Horne’s death in 1916, Count Carlo Gamba and the Superintendent of the Galleries, Giovanni Poggi, completed the furnishing of the rooms, according to the criteria Horne passed on to them. 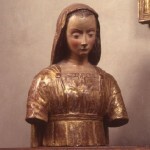 The collection is composed of very valuable paintings, sculptures, ceramics, articles both of jewelry and for other uses, furniture, small plates, seals and fabrics – all, or the majority of which, date back to the 1300’s, 1400’s and 1500’s. What constitutes one of the Horne collection’s essential prerogatives is the absolute coherence and harmony which the incredible variety of works and objects have with their expository ambience. In addition, of notable interest, are the stockpile of drawings and prints from the 1500’s to the 1800’s, the valuable archives and most of all the rich library in Herbert Horne’s ideal reconstruction of a cultured and well-to-do Renaissance gentleman’s palace. 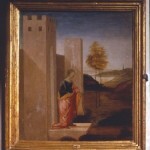 Il paesaggio disegnato. John Constable e i maestri inglesi nella raccolta Horne,catalogo della mostra a cura di Elisabetta Nardinocchi e Matilde Casati, Firenze, Mandragora 2009. 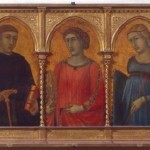 Herbert Percy Horne e Firenze, atti della giornata di studi (Firenze, Fondazione Herbert Horne 2001), a cura di Elisabetta Nardinocchi, Firenze, Edizioni La Meridiana, 2005. 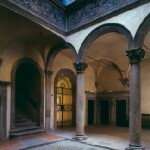 The courtyard under the covered loggia of the Corsi palace is the beginning of the tour. The palace stands between two historic streets in the Santa Croce neighbourhood near the Grazie Bridge. It had belonged to the powerful Alberti family since the 14th century but the Podestà court assigned it to the Corsi brothers who enlarged and radically changed the building, transforming it in the reference model for the many residences of the town’s ruling class during the 16th century. Size: 160 cm. x168 cm. 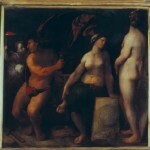 This work was painted by Dosso Dossi at the court of Ferrara, during the rule of Alfonso I d’Este. 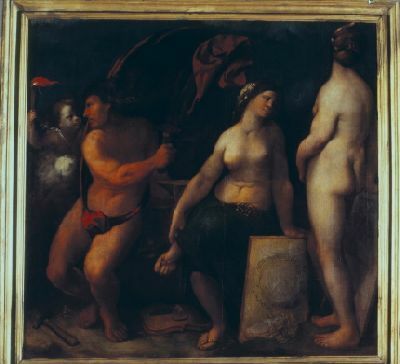 In the painting the man is the mythical figure of Tubal-Cain, the founder of music, whereas the two female figures are allegories of sacred and profane music. 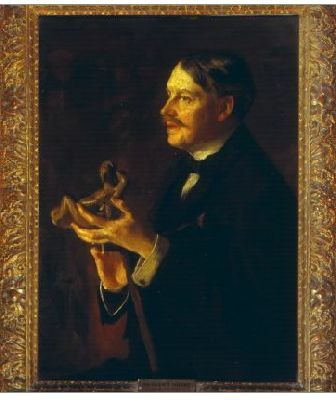 The model is depicted in the painting by Harris Brown who portrayed H. P. Horne holding the statuette in his hands. Size: 84.3 cm. x 54 cm. 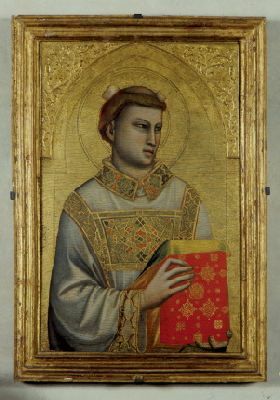 It has often been assumed the panel came from one of The chapels of the Basilica of Santa Croce, probably the Pulci and Berardi Chapel dedicated to Saint Stephen and Saint Lawrence. The portrait depicts H.P. 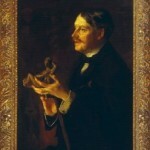 Horne (London 1864 – Florence1916) holding a ceramic model of a Venus in his hands. Horne was an architect; designer; scholar of art, music, and literature; and, above all, a collector. In fact, the Corsi palace, bought in 1911, was to become an invaluable treasure chest of all the works, drawings, prints, manuscripts, incunabula, cinquecentine, illuminated codices, books, and modern periodicals he accumulated over the years. Size: 70 cm. x 60 cm. x 50 cm. 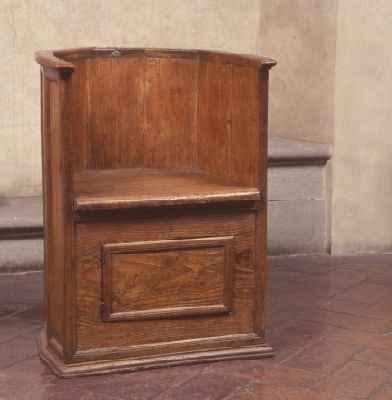 This rare chair dates back to the end of the15th century. 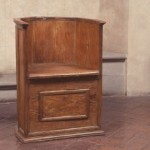 At one time, it was painted and clearly reserved for an important person, probably an abbot. Size: 58 cm. x171 cm. 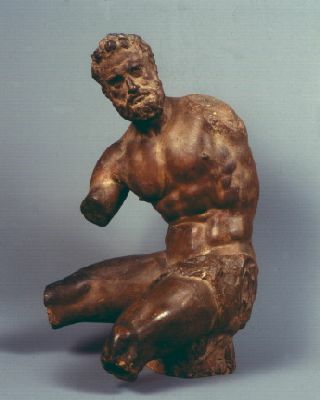 x 51 cm. The chest shows an unquestionable derivation from Vasarian prototypes. 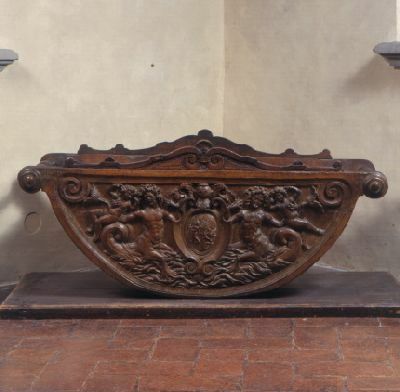 As for the tied-volute motif, it drew inspiration from the doors of the Tesoretto wardrobe in the Palazzo Vecchio. 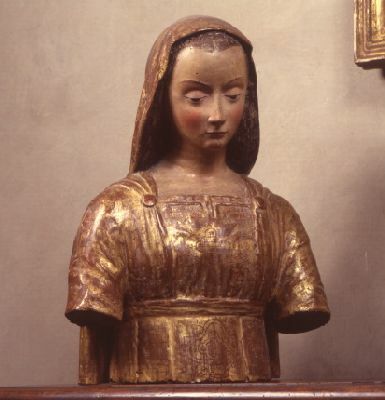 Similar to Leonardo’s studies for the Sforza monument, this work was intended for private furnishings, in line with a taste for collecting that was very popular in Florentine palaces in the early 16th century. Size: 53 cm. x 134 cm. 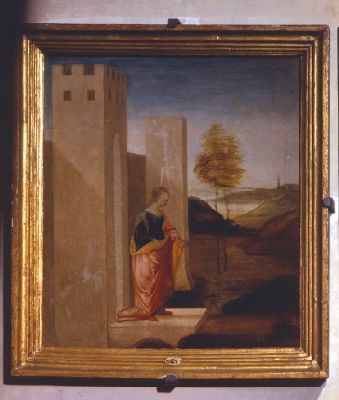 If not the front of a cassone, or wedding chest, this was certainly a wall panel for a patrician bedroom with a mythical subject favorable for establishing a new lineage. Size: 32 cm. 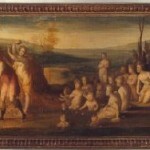 x 34 cm. Size: 45.5 cm. x 40 cm. 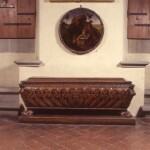 Side panel of a wedding chest, the external part that was exhibited publicly during the procession that accompanied the bride to her new residence. Size: 250 cm. 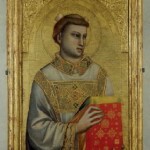 x 286 cm. 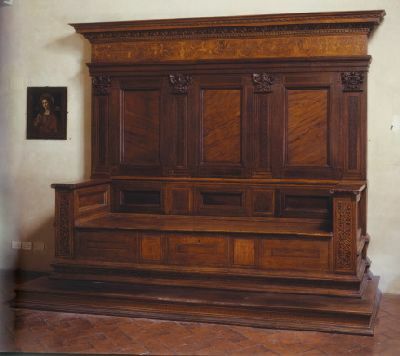 15th-century daybed that was used for resting or sleeping while clothed. 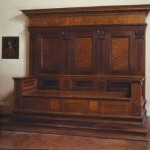 In the past, it was equipped with a mattress, blankets, and pillows (stored in the chest’s hinged compartment). Size: 63 cm. 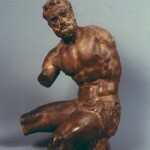 x 33 cm. 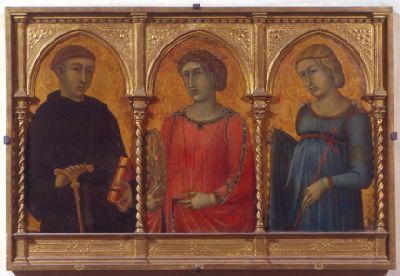 An early work by Pietro Lorenzetti, it is a reassembly of three panels from a dismembered polyptych. Size: 57.8 cm. x127 cm. x 47 cm. The carved ornaments with putti and tritons emerging from the water hint at the idea of birth. In addition to these cultured symbols, the widespread popular tradition added charms and talismans to keep away evil spirits. 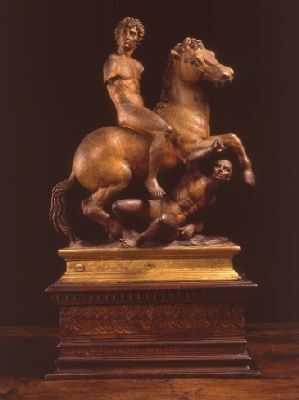 Clearly inspired by the Belvedere Torso in the Vatican, the work has been identified by Charles Avery as the preliminary model for the statue of Euphrates, part of the Ocean fountain on the Isolotto in the Boboli Gardens. 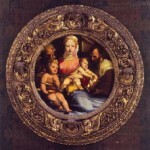 Note the splendid carved and gilded frame, which is definitely similar to that of Michelangelo’s Doni Tondo housed in the Uffizi Gallery, referable to Giovanni Barili’s work. Size: 28 cm. 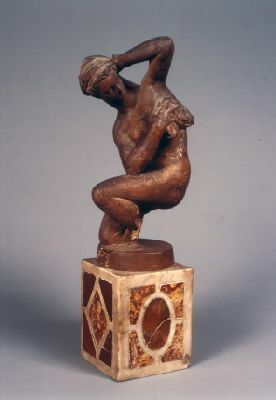 x 25 cm. 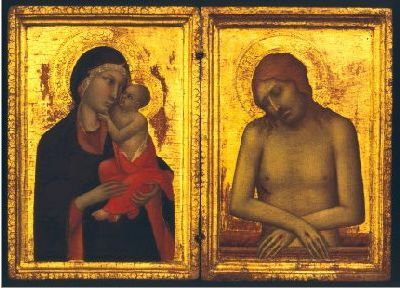 This diptych by Simone Martini depicts, on a gold background, the Madonna and Child on the left and the Ecce Homo on the right. 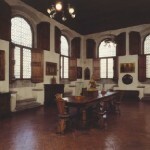 One of the rooms in the Horne Museum. 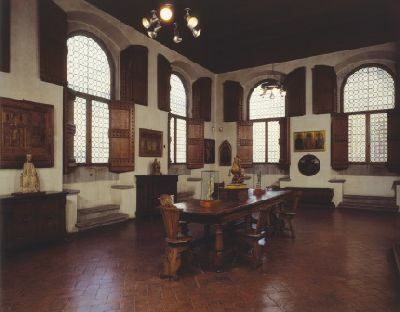 Note the typical characteristic of a house-museum with works displayed as furnishings inside rooms that are almost untouched in comparison with the palace’s original form. By car: once in Florence, follow the signs for the Viali di Circonvallazione (boulevards), then for Piazza Beccaria (Santa Croce neighborhood). Park in Lungarno della Zecca. Special opening by request, for a fee. School activities: 10 a.m. – 12 p.m.
€ 4.00 per person for families.